Travel to the home of the tango and get to know the elegant neighborhoods and exquisite gastronomy of Buenos Aires. Fall in love with nature at the Iguazu Falls, where the powerful waterfalls captivate your senses. Discover Patagonia in El Calafate and visit the famous Perito Moreno located in this land of glaciers and spectacular landscapes. *Documentation of the internal flights will be available in the "My bookings" section in your "Customer Area" 7 days after you have made your booking. Internal flights have a 15kg luggage allowance. Tourist Tax (Ecotasa). Park Entrance Fees - approximately $36, drinks, tips and anything not mentioned in the Price Includes section. Breakfast at the hotel. Spend the day on an included tour exploring the charming corners of the city. 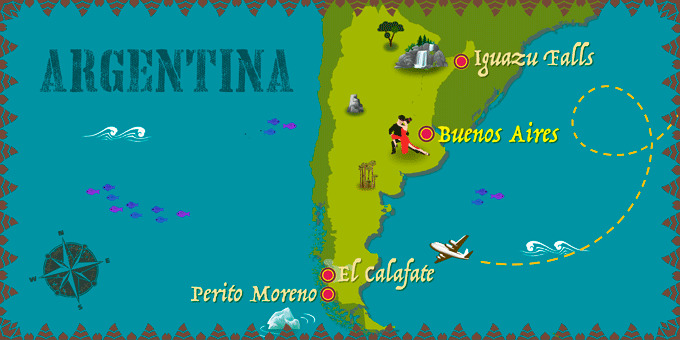 The city is known as the birthplace of the Tango. Explore the contrasting neighborhoods: the colorful houses of La Boca, the culture of La Recoleta, the old town, San Telmo or the young, vibrant neighborhood of Puerto Madero. Overnight stay at in Buenos Aires. Breakfast at the hotel. Enjoy a tour on the Argentinian side of the Iguazu Falls. Discover one of the greatest creations of Mother Nature from the green train which transports you to two trails. Start on the upper trail following 1/2 mile of suspended walkways and a view of the falls from above. Then continue to the lower trail and discover the suspended footbridges alongside the falls. We suggest our optional excursion which will take you on a boat right under the waterfalls to get an up-close perspective of the falls. * Overnight in Iguazu. * Optional excursion Glaciers Cruise Maria Turquesa: Board the boat at Lake Argentino, and heading northwest you will visit Escuadra Bay and Condoreras Wall and a number of magnificent glaciers. Navigate through the Los Tempanos Channel towards the north wall of the iconic Perito Moreno glacier, for a unique view of this wonder. The excursion includes a Lunch Box onboard. Price per person: $163. Breakfast at the hotel. Transfer to the airport to board a flight to Buenos Aires. Depending on your flight arrival time, spend the afternoon to further discover the vibrant capital. Overnight in Buenos Aires. Breakfast at the hotel. Transfer to the airport for the flight back to the U.S. Overnight flight. Breakfast at the hotel. Spend the day on an included tour exploring the charming corners of the city. The city is known as the birthplace of the Tango. Explore the contrasting neighborhoods: the colorful houses of La Boca, the culture of La Recoleta, the old town, San Telmo or the young, vibrant neighborhood of Puerto Madero. Overnight stay at in Buenos Aires..